What does WALC stand for? What does WALC mean? 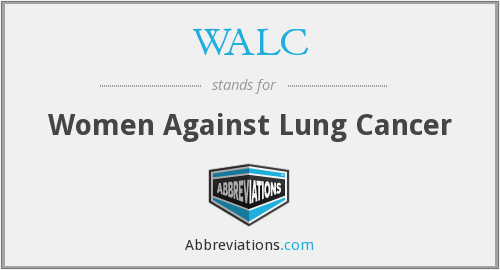 This page is about the various possible meanings of the acronym, abbreviation, shorthand or slang term: WALC. WALC is a radio station located in Charleston, South Carolina. The station is licensed by the Federal Communications Commission to broadcast with 13.5 kW on 100.5 FM. It is owned by the Radio Training Network and broadcasts a Contemporary Christian format under the name HIS Radio 100.5. Programming includes music by such artists as MercyMe, Chasen, Newsboys, Chris Tomlin, Steven Curtis Chapman, Jeremy Camp, Avalon, Toby Mac, and Mark Schultz, as well a few family ministries such as those of Dr. James Dobson and Charles Stanley. However, the station focuses primarily on music programming. Couldn't find the full form or full meaning of WALC? Know what is WALC? Got another good explanation for WALC? Don't keep it to yourself! "WALC." Abbreviations.com. STANDS4 LLC, 2019. Web. 18 Apr. 2019. <https://www.abbreviations.com/WALC>.